Ballen’s Best! 10 Best Places to eat in Las Vegas on a budget! Las Vegas is a city that is alive and full of energy. People are very aware of the glamour and glitter that draws crowds, but you might be surprised to find that you can feed your family very well in Las Vegas without breaking the bank. 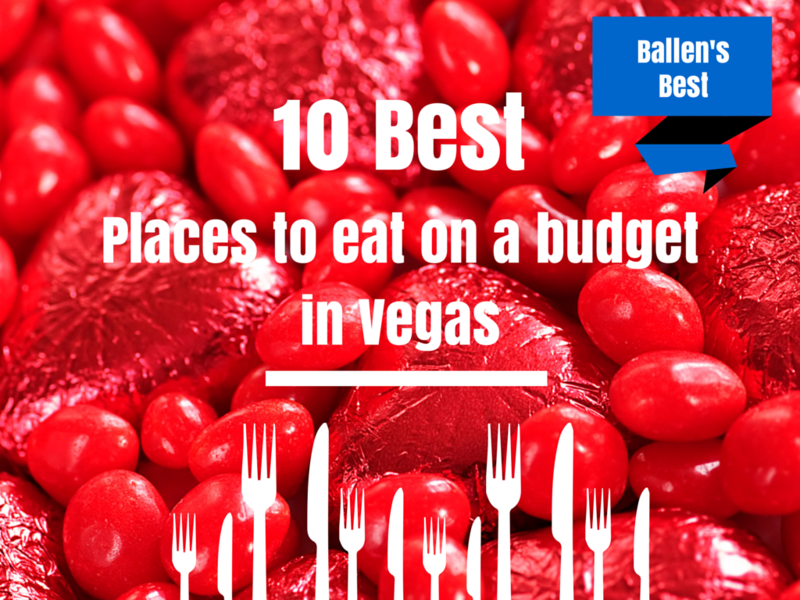 Here’s our top 10 list of best places to eat in Las Vegas on a budget. All restaurants on our list are wheelchair accessible and accept major credit cards. The Earl of Sandwich is located at 3667 Las Vegas Boulevard, S. Planet Hollywood Resort & Casino and is open 24 hours a day, 7 days a week. Their menu includes a variety of soups, salads, wraps, sandwiches, and side items. They have dessert items that include fresh baked cookies and brownies. Sandwiches are generally under $10.00. Secret Pizza is located on the third floor of The Cosmopolitan of Las Vegas at 3708 Las Vegas Boulevard. There are no signs to tell you where to find Secret Pizza, but if you look past the pool table you might find the secret passageway to yummy, pizza goodness. Seating is limited, but there are places to stand and enjoy your pizza slices. They are open from 11:00 am until 5:00 am all week long. They are great for late night eating in a casual atmosphere. KoMex Fusion is located at 633 North Decatur Boulevard, Ste H. They are open from 11:00 am -8:00 pm, Monday – Saturday and serve a Mexican Korean fusion of menu items that include a bulgogi burrito, kimchi fried rice, and pan fried fish. Most items on menu are $6 – $10, with some items like the Mexican Taco as inexpensive as $2.00. An excellent lunch spot that’s great for the entire family. In-N-Out Burger is located at 4888 Dean martin Drive. They are open from 10:30 am – 1:00 am, all week long. They have inside and outside seating, as well as a drive thru at this location. They have cheeseburgers, fries and shakes that are reasonably priced. They even have a secret menu that includes Protein Style, your choice of burger wrapped in hand-leafed lettuce instead of a bun. Monta Ramen is located at 5030 Spring Mountain Road, Ste. 6 in Chinatown area and is open from 11:30 am – 11:00 pm, all week long. You can get a Gyoza for around $5.00 and most ramen bowls are under $7.00, which makes this a very budget friendly place to take your family. The seating area is a bit small, but it has an authentic feeling, and you can choose to eat at the bar. Phat Phrank’s is located at 4850 West Sunset Road and is open from 7:00 am – 7:00 pm, Monday-Saturday. The menu has breakfast items like Chorizo Burritos for around $6.00 and lunch/dinner items like Carne Asada for around $8.00. The menu has a great deal of variety, but people seem to really rave about the fish tacos. The owner has been known to come out and speak to diners. Baguette Café is located at 8359 West Sunset Road and is open from 7:00 am – 5:00 pm, Monday – Friday. It’s located in an office park, but don’t let that stop you from visiting. The menu has everything from Blueberry Muffins and Quiche to Soups and sandwiches. It’s a wonderful place to take your family for breakfast or lunch, the prices are super affordable and it has indoor and outdoor seating. Mr. Mama’s is located at 5580 South Decatur Boulevard, Ste. 112 and is open from 6:00 am – 3:00 pm, Monday – Friday, but it closes and hour earlier on Saturday and Sunday. If you’re looking for an affordable, sit down meal with your family that invokes a feeling of comfort, this is the place. They have menu items like pancakes for $2.25 and Patty Melts for $8.50. They also have soups, salads, wraps, and desserts. Weeziana Gumbo & More is located at 6475 West Charleston Boulevard and is open from Noon – 8:00 pm, Tuesday- Sunday. This is down-home cooking with a Louisiana twist that is delicious and great for your wallet. They have items like seafood gumbo and bread pudding. Buldogis Gourmet Hot Dogs is located at 2291 South Fort Apache Road, Ste. 102 and is open from 11:00 am – 9:00 pm, every day but Sunday when it’s open until 5:00 pm. They will put anything on your gourmet hot dog from chili to kimchi. They also serve chicken wings and other menu items for those who want something other than a hot dog.